If you ever experienced your PON suddenly becoming rigid and making gagging sounds, while appearing to have breathing problems, you may wish to become informed about causes of this episode. Most PON owners are clueless in this type of situation and tend to seek advice among other PON owners. It is frightening to observe such an event. According to family veterinarians, it is a spasm that occurs when the soft palate or throat becomes irritated. This "reverse sneezing" is also called "pharyngeal gag reflex" because when this condition occurs, it seems dogs rapidly pull air into their nose, while with regular sneezing, air gets pushed out. When "reverse sneezing" takes place, dogs will become rigid, and extend their head/neck, and will make loud snorting sound. What causes PONS to have a "reverse sneezing" episode? ** Irritation of soft palate, which causes spasm. 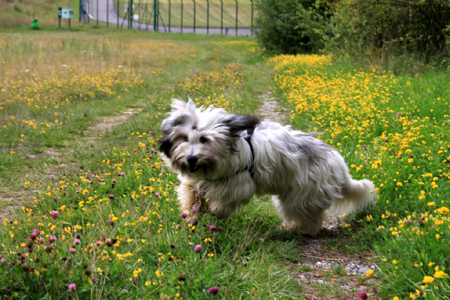 When a spasm occurs, dogs have difficulty breathing normally. If your PONS have reverse sneezing episodes very frequently, it is best to take them to the vet who may do blood testing. Avoid waiting for an emergency, act sooner than later. Good luck and please keep us updated on developments.